​Located in the beautiful Welsh South Valleys made famous for the steel and mining industries. 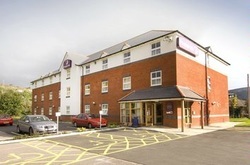 This Premier Inn is just a few hundred metres from the train station with regular trains through to Cardiff which is just 25 miles away. There is an on-site Brewers Fayre restaurant serving great value meals all day and free parking is available. Book direct for the best Premier Inn Ebbw Vale deals.